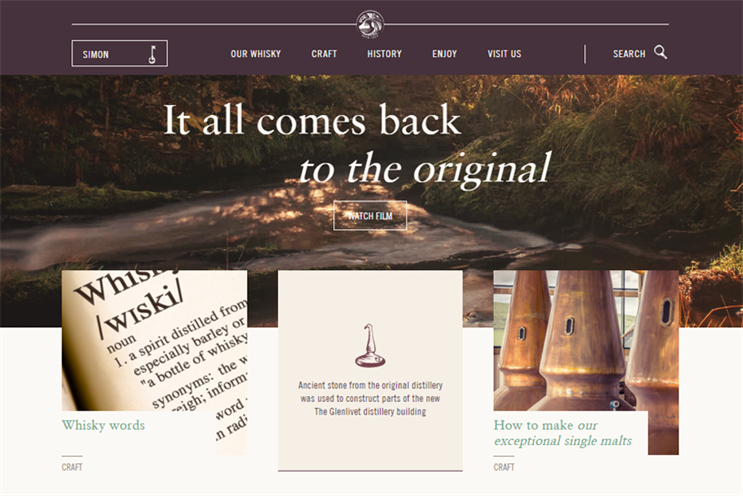 Single malt Scotch whisky brand The Glenlivet has launched a new website with increased focus on its most loyal customers, dubbed the Guardians of The Glenlivet. The new site, created with digital agency Zone, has been redesigned as a hub for the scheme, which now has around 350,000 members signed up around the world. When signed in, the new site gives Guardians access to a range of materials on topics related to whisky and The Glenlivet brand. As part of the relaunch, the Pernod Ricard-owned brand is also adding Instagram to its social media channels, alongside Facebook, Twitter and Youtube. The Glenlivet has more than 440,000 fans on Facebook. "The single malt whisky category is currently the fastest growing spirits category in the world," said Ary Ganeshalingam, The Glenlivet global marketing manager. "Creating brand differentiation in the category is a challenge. Recommendation from trusted friends is key, which is why strengthening The Glenlivet’s CRM programme and building even more advocates online is crucial to maximising its brand potential." Last spring, The Glenlivet launched Founder’s Reserve, a new ‘core expression’ in its range. The whisky was developed to be smooth and fruity, appealing to drinkers new to single malt and making it suitable for use in cocktails.